UK-based Weightron Bilanciai has introduced its DD2050HS hopper scale terminal, a powerful and versatile PC-based instrument, specifically designed for controlling and managing discontinuous hopper scales. Such totalizing weighers are used extensively for the bulk weighing of free-flowing granular materials in a diverse range of applications including: shiploading and offloading*, silo material transfer and batch feeding. In a typical system, material is loaded into the bulk weigh hopper using a variety of methods, weighed and then discharged ready for the next batch. The individual batch weights are totalized to provide the total weight of material transported over a given time. Accuracy and speed are crucial for optimum throughput efficiency. Based on Weightron’s well-established DD2050 touch screen weight terminal, the weights and measures approved HS version has been specially developed to meet the demands for high-speed and accurate weighing of bulk materials at ports and terminals. The instrument features a large, user-friendly 300mm touch screen that provides a comprehensive graphic interface for the operator with full alphanumeric capability for data entry together with images of the hopper scale. The operator can clearly follow the weighing process on screen and in addition, the USB interface can be used for the connection of a remote keyboard and printer. Print-outs can be set up to provide all key data from a particular run. The controller is ideal for new installations or upgrading existing discontinuous hopper scales which use outdated and standalone technology. 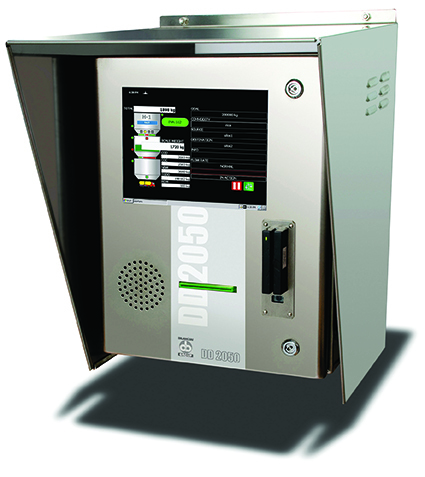 The DD2050HS connects directly with existing load-cell based hopper scales, without the need for additional instrumentation. It provides all the necessary inputs and outputs to control the whole weighing process. Versatile fine and coarse set-points ensure pinpoint material flow cut off accuracy and speed. The full capabilities of the multi-lingual DD2050HS can be realized when one or more hopper scales are connected via Weightron’s powerful CenterPoint software, which can be installed on a standard Windows PC or Windows Server. It supports orders, planning operations and product route control, whilst handling stock management. CenterPoint collects the Start report, each Batch report and the Stop report of each operation. For added versatility, the software can integrate with third party ERP systems such as SAP providing the user with extensive data import/export capabilities at single or multiple locations, both online and offline. In addition to supplying the instrumentation and software, Weightron can also assess the condition of the existing load cells and mounting hardware supporting the hopper and carry out upgrades as necessary. The DD2050HS systems can also be covered by Weightron’s extensive service and support packages, ensuring optimized productivity and up-time. * For granular and solid bulk products such as grain, animal feeds, soya meal and sugar, discontinuous bulk weighers provide an effective solution for verifying loading and unloading quantities, commonly known as draft weighing data. For over a century, draft surveys have been internationally accepted as an accurate and convenient means of establishing the weight of bulk cargoes, providing the basis for the preparation of bills of lading and assessing various charges and port fees.